Palitaw has always fascinated me even as a child. 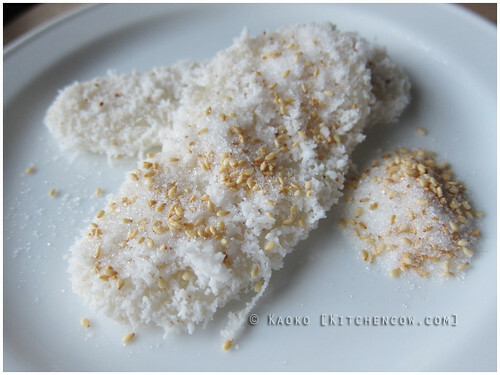 This sticky bland rice cake, flavored with fresh coconut, and sugar made fragrant with sesame seeds was a childhood merienda staple, served up by my lolas during hot summer afternoons. Back then, what made palitaw really fascinating was how simple it seemed to cook and how fun it was to make. It was one of the snacks that I insisted on helping my lolas with, mostly because it was so much fun molding shapes from the glutinous rice paste. It was like working with Play-Doh and I’d be totally focused on creating perfect tongue-like ovals from the sticky white dough. After molding them into palitaw shapes, I’d watch as my Lola Cianing would drop the uncooked dough patties into boiling water where they’d sink to the bottom of the pan, then wait until they’d float (litaw) to the top, indicating that they’re cooked. I’m sure whoever coined the rhyme “Lulubog, lilitaw, parang palitaw,” (It sinks, it floats, just like palitaw) found them just as mesmerizing as I did as a kid. It’s been years since I last ate palitaw. Sure, it’s sold in small carinderias but I’ve always been unenthusiastic about buying, probably because it’s the childhood memories I have of them that makes them sweeter. The same childhood memories that had me scrambling around in the kitchen one afternoon, desperate for a bite of sticky sweet nostalgia, made fragrant by sesame seeds toasting on the stove. Toast sesame seeds on medium to low heat until fragrant and lightly browned. Keep them moving in your pan, swishing it about to avoid burning. 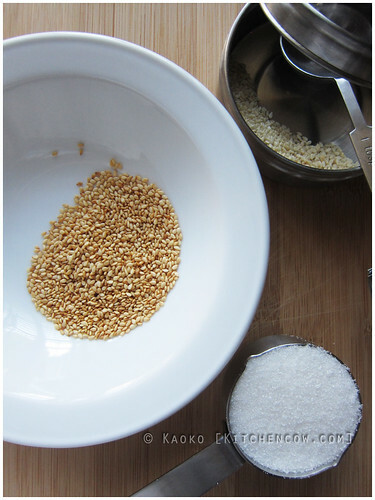 Mix toasted sesame seeds with sugar. Set aside. 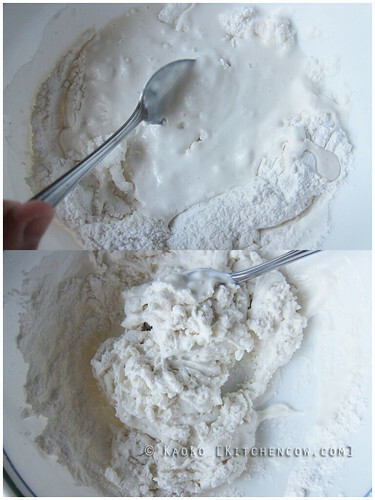 Mix water and glutinous rice flour until dough-like, adding extra water and flour until you get to a desired dough consistency that kneads softly, yet peels free from your fingers. If it’s too sticky, add flour. If it breaks apart, add more water. Form the dough into little logs, before flattening them to form tongues. Other shapes, like circles, work too, but if we want classic palitaw, tongue-like ovals are the way to go. Bring water to a rolling boil in a large pot. I use a 1-liter saucepan at the very least. Once boiling, drop the palitaw, 2-3 at a time, making sure they don’t fall on top of each other as they sink. Wait until they float. When they do, fish them out of the water with a slotted spoon or a flat wire paddle, then place in a dish of coconut flakes. Roll until covered with coconuts. Serve with the sesame seed sugar on the side. What do you usually do for New Year’s? I love palitaw, but it never occurred to me to actually make it myself. Haha! Thanks for sharing the recipe! I haven’t had palitaw in years, too. You and me both! It took me how many years to decide on giving it a shot. It’s fascinating no? I wanted to try shooting it but it’s difficult holding the camera steady while doing the actual cooking. Unfortunately, my tripod doesn’t work with my phone camera and my p&s’s video function isn’t as nice as my phone’s.